The CT570 is an excellent choice for testing DSL, Cable-Modem and other configurations with many relatively low-speed endpoints generating traffic against a higher-speed core network. The CT570 uses a 1U rackmount LANforge machine and a managed ethernet switch supporting 802.1Q VLANs to provide 48 ports of 10/100 ethernet traffic generation. The system can generate and receive about 2Gbps (4Gbps total across the backplane). Other quantities of ports are available, and additional systems can be clustered for increased traffic generation capacity. The CT570 1U rackmount chassis fits into a standard rack and is about 14 inches deep. It supports standard VGA, Keyboard, and Mouse interfaces for easy console/desktop access to the system. The ethernet switch is a standard managed ethernet switch and can be rack-mounted or used on the desktop. The LANforge rackmount chassis is relatively noisy, so it is better for a data center deployment than a desktop environment. Other form factors better suited for traveling or desktop use are also available at similar prices and performance. This system includes the Armageddon feature at no additional charge. VoIP support is priced separately. Please communicate your preferences to your sales representative. No additional hardware or software is required, but you may wish to manage the system using the LANforge-GUI on a separate machine. Connect LANforge VLAN-trunk port to the VLAN switch's trunk port. Connect ports 1-48 on the VLAN switch to the CPE devices (system-under-test). 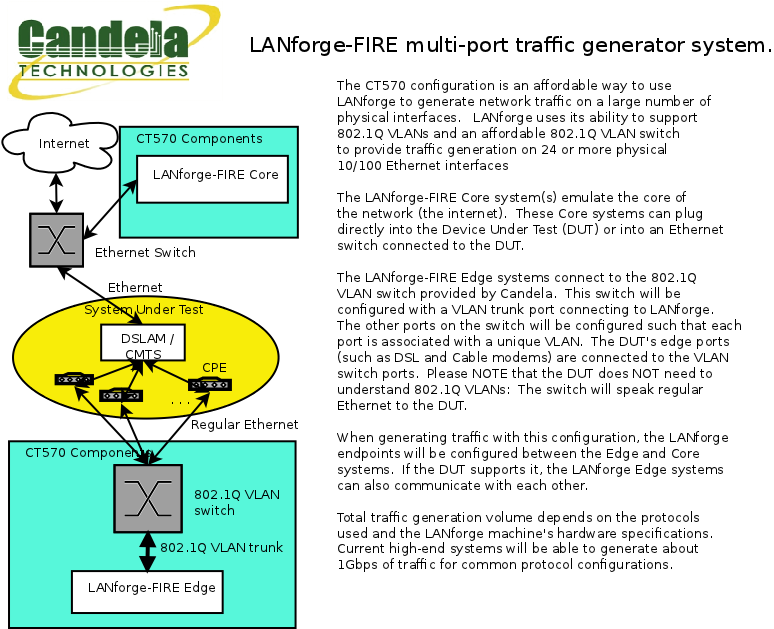 Connect other LANforge traffic generating port to the up-stream side of the CMTS (system-under-test). The CT570 should now boot. If DHCP is enabled on the Management network, the CT570 will automatically acquire an IP address. If DHCP is not available, the IP address will be set to 192.168.1.101 by the LANforge scripts. Start the LANforge-GUI on the management PC, or the CT570 server if managing locally, and click the 'Discover' button. It should find the CT570 appliance and add the IP address to the drop-down box in the Connect widget. Press 'Connect' and you will be connected to the CT570. Select the Layer 3, Layer 4 and other LANforge FIRE related tabs in the GUI to see existing traffic connections and to modify them or add new ones. You can also view a real-time report of the test with the 'Display' button for some traffic types. LANforge can send Layer 3, Armageddon and most other traffic types between any two physical or virtual ports, so one can send traffic between port vlan0 and vlan1, vlan0 and vlan2, vlan3 and vlan4, etc. Use the Port Mgr tab in the GUI to configure the IP addresses for the interfaces as appropriate for your network and cabling. The CT570 is able to generate 2Gbps or more, depending on protocols mix and speed of the network under test. Supports 48 ports of 10/100 ethernet traffic generation by utilizing the 48-port VLAN switch. Supports at least 35 VoIP (SIP, RTP) calls if appropriate licenses are purchased. The portable chassis configurations may run at different speeds than the 1U rackmount systems.